Speaking yesterday at the 2016 Annual Conference of the Mallam Bashir Yusuf-led-Inter-Party Advisory Council (IPAC) held at the Yar’Adua Centre, Abuja, Osinbajo said the President Muhammadu Buhari-led administration recognised the critical role of opposition parties in deepening democracy, but added that it would not jettison the fight against corruption. He said when the current government took over from the PDP-led government in May last year, it found out that a large chunk of money meant for the purchase of arms to fight terrorists in the North-east was diverted. ‎Osinbajo, who was represented by his Special Assistant, Political Parties, Senator Babafemi Ojudu, said the federal government was not targeting ‎opposition parties in its anti-corruption drive but was desirous of bringing sanity in order to sustain democracy in the country. “Politics and elections should not be about going to war or ‎the depletion of public resources. Never again will government agencies be used in favour of any political party to win elections. The war against corruption is not targeted at the opposition parties. “What government is doing now is that money meant for essential services should not be diverted to fund campaigns or to any other purpose,” he said. Explaining further on the anti-corruption drive, Osinbajo said investigations had revealed that huge sums of money voted for security were diverted ‎into private pockets while part of the money was used for election campaigns by the PDP-led government. According to the vice-president, there had to be a stop to the malfeasance, adding that IPAC should play a critical role in educating political parties and the general public on the issue so that ‎democracy can survive in Nigeria. 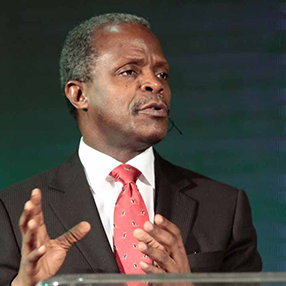 Osinbajo recounted the terrible experience of the military in the hands of Boko Haram insurgents during the regime of former President Goodluck Jonathan, when some soldiers went into battle with obsolete weapons. ‎Senate President Bukola Saraki, in his remarks, called for concerted efforts to sustain the democratic culture in the country. He said that in order to end violence in politics, strict and heavy legal and political sanctions must be imposed on those that still choose to perpetrate violent acts. “We must work towards creating a system of responsible political behaviour both within and outside our parties – letting our supporters know that violence in all its forms will not be tolerated by parties and their proxies,” he said. In his speech at the conference, the INEC Chairman, Prof. Mahmoud Yakubu, said that the commission had so far received 41 fresh applications from political associations seeking registration. He charged political parties in the country to adhere to INEC’s guidelines in the conduct of their affairs, adding that compliance would help to promote stability in the polity.